We are currently looking for volunteers for a summer workcamp at the Cromlech at Old Zhelezare, also called the Bulgarian Stonehendge organized by a small civic organization in Bulgaria called Foundation “Save the Cromlech in Old Zhelezare”. We are searching for people from home and abroad interested in the preservation of historical monuments for future generations who wish to volunteer for saving from destruction of megalithic monument cromlech – Thracian Observatory in ” Cholakova mound ” near Old Zhelezare. Small civic organization from Bulgaria, overcoming many administrative and financial difficulties over the past two years, was able to organize and finance by raising broad public donation fund the archaeological excavations for further research of an ancient 26th century old megalithic monument cromlech 24 stone stelae, called the Bulgarian Stonehenge. This happens more than 10 years after the initial discovery of the archaeological monument, during which it was abandoned by cultural institutions and wich led to come down to desolation and stay forgotten. The excavations will continue for one month. Two groups of 10 volunteers each, can join to the team of experts during this period. Starting date is to be confirmed as soon as possible. Participation of a volunteer in both groups for the whole duration of the project is allowed. The village of Staro Zhelezare (Old Zhelezare) is located in the south part of Bulgaria, 160 km from the capital city Sofia. In close proximity are other major archaeological sites in Hisarya, Starosel and Strelcha and is part of an overall interconnected Thracian religious complex from the time of antiquity and the existence of the independent kingdom of the Thracian Odryssae tribe in the Bulgarian lands. All partner and member organizations of SCI network. Foundation “Save the Cromlech in Old Zhelezare” is a civic organization, which aims to save from destruction and reconstruction a unique ancient facility with religious and astronomical function of age more than 26 centuries. This is cromlech (stone circle) with a diameter of 7 meters and 24 stone slabs arranged in a circle. Some of them have a ten-foot height. Almost like at Stonehenge. The Cromlech is one of the three found in Bulgaria and the only one in the world, buried under a mound, probably during the campaign of the Persian King Darius in Thrace in the VI century BC. According to research, the complex was built by the Thracian tribe Odryssae. The volunteers will get acquainted with folk traditions, cultural and folk customs of the local community in the House of traditions in the village of Staro Zhelezare. Volunteers can see customs connected with Midsummer day of the Sun, displayed by local amateurs, Bulgarian folk customs and could visit the exhibition of folk costumes or paintings of local artists in the ethnographic museum in the village. 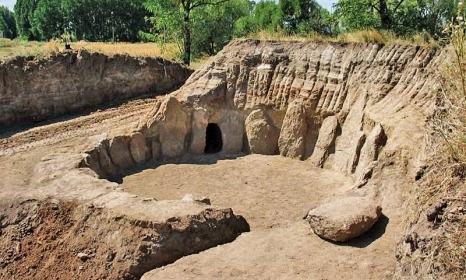 The initiative is published so far in more than 200 electronic and print media, among which and 3 television channels, who supported the project to restore the megalithic monument cromlech – Thracian Observatory in ” Cholakova mound “. The project of socializing Cholakova mound , prepared by the foundation “Save Cromlech in Old Zhelezare” expressed interest and will of the local community. The project has received the full cooperation and support of the local municipality and the mayor of Old Zhelezare. This is the first time in our country when a civic organization managed to overcome all the bureaucratic obstacles and is willing and after completion of these excavations in 2016, the Foundation will continue next year with developing a project for its salvation, reconstruction and turning it into an object of international cultural tourism. The Foundation will provide volunteers with working tools – shovels, buckets, brushes, sieves, spatulas, wheelbarrows. Instructions on how to use the tools will be given by the head of the archaeological team and the tasks for each day will be given to all. The work will be on weekdays. It will start every day at 7:00 a.m. and will continue till 4 p.m. including breakfast, coffee breaks and one hour lunch break. The first group will work also on Saturday. Volunteers will be given also raincoats and or sun hats depending on the weather conditions. If the rain is heavy, the work will be closed and group activities will be organized or free time will be given to the volunteers. Young people willing to engage in field work to support the archaeological team for excavations. The field work will be associated with intense bending, squatting and alertness during the cleaning and removal of artifacts from the ground. People interested in ancient history, archaeology, local customs. A person is appointed by the Foundation to be joining both groups who will take care for organizing the volunteers and ensure the delivery of products of their list for weekly food supplies, water and sanitation materials for the apartment in which the volunteers will be placed and the archaeological site, and implementation of applications for a hot meal in the evening, if any. Also a camp coordinator will be appointed by CVS – Bulgaria, who will take care for the communication between the foundation and the volunteers, to support the volunteers in their daily needs, to organize the free time and to translate if needed. All travel costs are at the expense of the volunteers. SCI and CVS support eco-friendly traveling options. SCI insurance is included for all volunteers for the duration of the workcamp. Three meals a day are covered by the hosting organization. Alcohol drinks are excluded by the menu and will be on the expenses of the volunteer. Accommodation is provided by the hosting organization in a house, on the first floor, in 4 rooms and one bathroom/toilet with big tank for hot water.